St. Paul, Minn. — Bowling Green’s power play couldn’t execute when it mattered Friday. 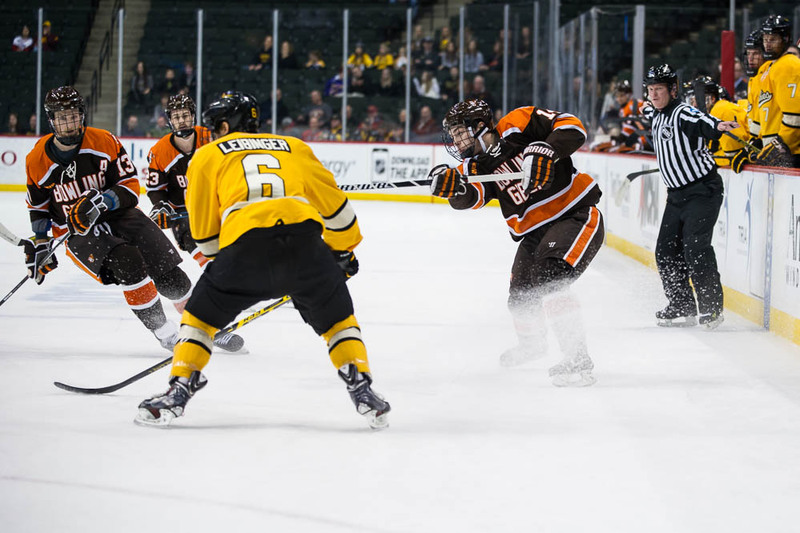 The Falcons were 0 of 3 with the extra man in a 5-2 loss to Michigan Tech in the semifinals of the Western Collegiate Hockey Association Final Five. They had just three shots in six minutes on the power play, and only a handful of good looks at the net. “(0 of 3) is not good in a one-game situation,” Falcon coach Chris Bergeron said. ”You get down to one-game situations, special teams are going to win and lose the game. The Falcon power play, even though it was 7 of 29 (24.1 percent) in its last seven games before Friday, is only fifth in the WCHA at 15.4 percent. BG’s three attempts with the extra man all game in the final 31 minutes. All three came with Tech holding a 2-1 lead. “It played a big part in the game. It wasn’t very good,” Bergeron said. EXECUTION: All five of Tech’s goals came after mistakes by the Falcons. The toughest was Tyler Heinonen’s breakaway goal which gave Tech a 3-2 lead with 14:37 remaining in the game. Heinonen took David Johnstone’s long pass near BG’s defensive blueline after getting behind BG defenseman Dajon Mingo. Mingo couldn’t catch Heinonen after defense partner Sean Walker jumped into the play at the offensive blueline and the Falcons turned the puck over. Heinonen, a sophomore left wing, finished with two goals and one assist, and had an on-ice rating of plus-4. He has 14 goals and nine assists thir season. Mike Neville increased Tech’s lead to 4-2, scoring on a tip of Mark Auk’s shot from the left point. MOMENTUM: Heinonen’s breakaway goal came only 2:17 after BG had tied the game 2-2 on a nice goal by Brent Tate, assisted by Mingo. Tech’s final goal came with 1:48 remaining when Joel L’Esperance scored into an empty net after BG pulled goalie Tommy Burke for the extra attacker. OFFENSE: The Falcons didn’t generate enough sustained pressure against Tech, but still had 22 shots on goal. But Tech goalie Jamie Phillips played well when needed. The Falcons were at their best late in the second period and early in the third period when Tech held a 2-1 lead. “We had our chances, but we didn’t have enough of them and we didn’t score on the ones we had,” Bergeron said. Phillips, a junior and first team All-WCHA selection, ranks second nationally with a 1.68 goals-against average and a .938 save percentage. Tech allows just 1.69 goals per game, second best in the country. FIND A WAY: Tech scored three of its five goals off shots from the blue line, whether they were on deflections or traffic in front of the net. “To score three goals like that is a credit to them, that’s how you score goals when it’s tight-checking,” Bergeron said. “We talked about taking away time and space in the defensive zone and we just didn’t did that. GOALS: Tate scored from the right side of the crease, tipping in Mingo’s hard pass from the right point. Mitch McLain gave the Falcons a 1-0 lead at 9:40 of the first period, tipping in Pierre-Luc Mercier’s pass on a 2-on-1 rush. McLain came down the middle to score on Mercier’s pass from the right wing. HOT STICK: McLain has scored a goal in each of the last three games he’s played and he has five goals in his last seven games. The freshman forward has a point in eight of his last 10 games, totaling five goals and four assists in that span. McLain returned to the lineup after sitting out Game 2 of BG’s quarterfinal sweep of Northern Michigan in the Ice Arena last night. He left the series opener after a hard hit into the boards during overtime of BG’s 3-2 victory. IN GOAL: BG’s Tommy Burke stopped 27 shots, 12 coming in the third period. The Huskies held a 32-24 edge in shots, including a 15-7 margin in the third period. PK: The Falcons killed off Tech’s only power play of the game, that coming in the third period with the Huskies leading 4-2. That was BG’s only penalty of the game. The Falcon penalty-killing still leads the nation at 89.8 percent. HOMECOMING: Three BG players are from Minnesota — McLain, Burke and Matt Pohlkamp. HELPER: Burke’s assist on McLain’s goal was the first of his BG career. LINEUP: The Falcons dressed 11 forwards and seven defensemen for the second straight game. Among the healthy scratches for BG were forward Jakob Reichert, Brett D’Andrea and Ben Greiner, and defenseman Braden Pears. ATTENDANCE: The WCHA didn’t announce an attendance for the BG-Tech game, instead opting for a one-day total for the two games. But attendance was sparse in the Xcel Energy Center that has a capacity of 18,568. The arena is the home of the NHL’s Minnesota State. NAP TIME: The players from BG and Ferris State had a hard time taking their usual pre-game naps Friday afternoon. Ferris State and Minnesota State played in the second semifinal. Their hotel is undergoing renovations and construction was easily heard throughout the hotel. Tech and Minnesota State were staying at a different hotel. ALL IN THE FAMILY: Trent Eigner, the brother of BG’s assistant coach, won a state high school championship recently as the head coach at Lakeville (Minn.) North. The Eigners both played college hockey, Ty at BG and Trent at Miami.